The compile step is optional for this update, as all that really changed is some configuration files, but the above is generally how you would track updates on the development branch. I have also several of the GUI interfaces that come with LinuxCNC. The default axis interface is currently a CPU hog, and will need to be switched to something with better performance (or perhaps whatever is chewing up cycles can be identified and fixed). The gscreen interface currently suffers from the same problem, while the tkemc interface is light on CPU cycles, but somewhat harder on the eyes. 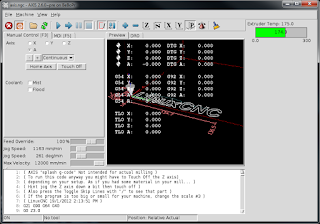 A customized interface for 3D printing is on the list of features to work on, but I'm more of a low-level guy. Holler if you'd like to help out!